Reykjavik, March 23: Authorities in Iceland has temporarily closed the canyon of Fjaorargljufur, a popular tourist attraction, due to environmental damage caused by an ever-increasing number of visitors, the media reported. 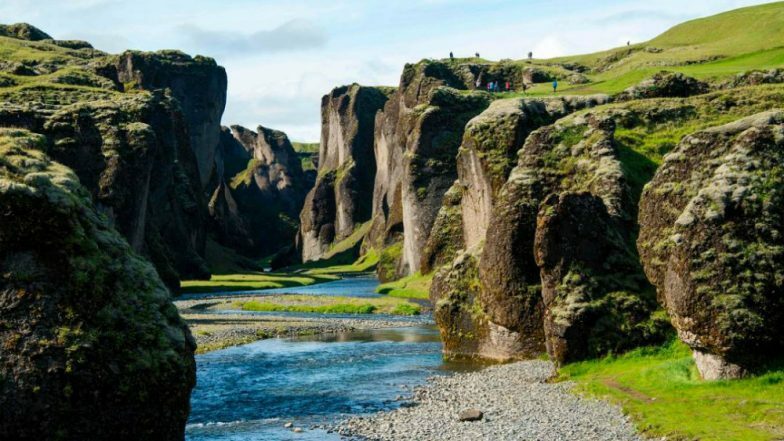 Located in southern Iceland about 70 km from Vik, the canyon will be closed until June, despite the early summer start of the country's high tourism season, CNN quoted the Environmental Agency of Iceland as saying on Friday. The canyon was also briefly closed for weather-related maintenance in 2018. While Iceland has many gorgeous natural formations throughout the country, the 100-meter-deep Fjaorargljufur has become very popular for several reasons. Its tall, slender canyon walls are sheer, creating a beautiful effect that photographers love. Boracay Island in Philippines Shut Down for Environmental Rehabilitation. Inga Hlin Palsdottir, director of the national tourism agency Visit Iceland, told CNN that it was not not fair to blame over-tourism for Fjaorargljufur's closure. "It's just a natural wonder that wasn't meant to be that popular," she said. "We need to build a better infrastructure there so we can invite people all year round. We need paths that can be discovered all year round. It's not only because of nature, it's a safety issue." Iceland's popularity as a tourism destination has skyrocketed in the past decade. Nearly 2.2 million people visited the country in 2017, according to the Icelandic Tourist Board, a figure which was way more that the number of people -- just 350,000 -- who actually live in Iceland.